Last weekend I travelled to my home city of Kaliningrad. These home trips always evoke some nostalgia. With the present blog in mind, this particular trip made me think about how visual culture has the power to change one’s identity. The notion of mixedupness pervades my whole life. I’m a Russian of Ukrainian and Belorussian origins from a formerly German city (before World War II), known today as a Russian city of Kaliningrad. I’ve lived in London, UK half of my life. I neither have any German roots nor do I speak German, despite my home city’s being of German origin. Yet, I feel that the city’s heritage has the power to speak to and influence its inhabitants with its unique architectural language. Kaliningrad is full of controversy and diversity as it combines German, Soviet and Russian identities. Its cultural controversy starts with the city’s name. Königsberg means King’s mountain in Old German. Kaliningrad, means Kalinin’s (a Bolshevik revolutionary) city in Russian. It was part of Germanic land (known as Eastern Prussia) for more than 800 years. It’s been a part of Russia for the last 70 years. Yet, no ethnic Germans remain in the region. Most left after World War II when the Soviets took over the city. Despite the Soviets’ attempts to erase the city’s European identity, Kaliningrad’s architecture inevitably reminds one of German heritage. Only fragments of German culture remain following the bombings during World War II. Yet, these remnants have become deeply embedded into Kaliningrad’s Russian and Soviet cultures. What immediately strikes one as a tourist coming to visit Kaliningrad is how Soviet austere building blocks clash with German Art-Nouveau (Jugendstil) and Brick Gothic (Baltic Brick) architecture. Two main buildings dominate the cityscape – the fourteenth-century Gothic-style Königsberg Cathedral (restored in 1992) and the 1970s unfinished neo-constructivist House of Soviets. They are striking testimonies to political power dynamics. To me, the House of Soviets has always looked like a monster associated with the austerity and deficit I experienced as a child. The building is a brutalist block of concrete built on the remains of the Königsberg Castle, the very heart of the destroyed city. It states clearly who was in charge. Today, it serves as a reminder of the utopian communist ideology. Cold, empty, dehumanised, the House of Soviets tells us about a once ambitious project that has never been completed, that remains unrealised. On the other hand, the Cathedral, built largely thanks to the donations made by ethnic Germans, became the centre of local and tourist attraction. 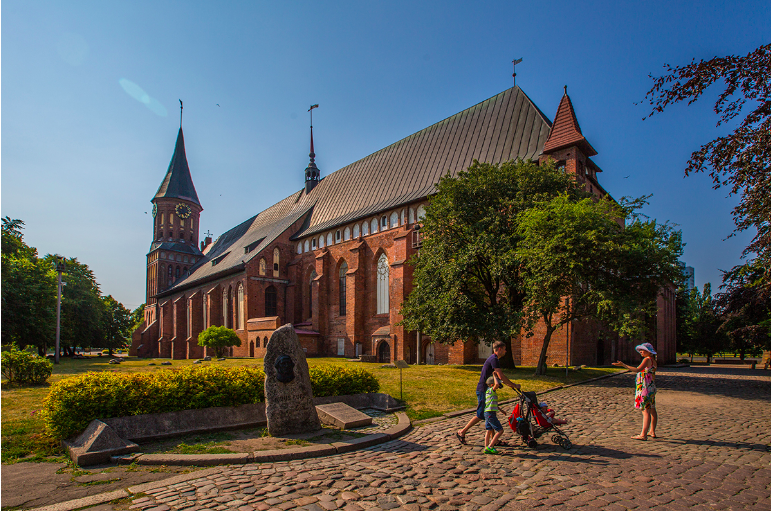 To me, the Königsberg Cathedral and the surrounding grounds bring out the warmest of my childhood memories since they served as a recreational area where people enjoyed picnics and festivals. Another imposing building structure is the Russian Orthodox cathedral built in the modern city centre, further away from the House of Soviets and the Cathedral. Built during the Putin era in place of the monumental statue of Lenin, it serves as another ideological tool - a reminder of who’s in charge today. Despite the government’s attempts to promote Russian-ness, Kaliningraders openly embrace the Prussian German past. This attitude manifests itself in numerous landmarks built in pseudo-neo-Gothic architectural style, like the Clock Tower in the city square. These modern architectural pastiches are spread throughout the city. In fact, the so-called Fishermen’s village, constructed in 2006-2010 in pseudo-Hanseatic style, became a major landmark. I am not an avid supporter of pseudo-historical recreations. However, I admit that like many of my fellow Kaliningraders, I proudly embrace the city’s German past in favour of the colourless Soviet concrete blocks and propagandist religious edifices.